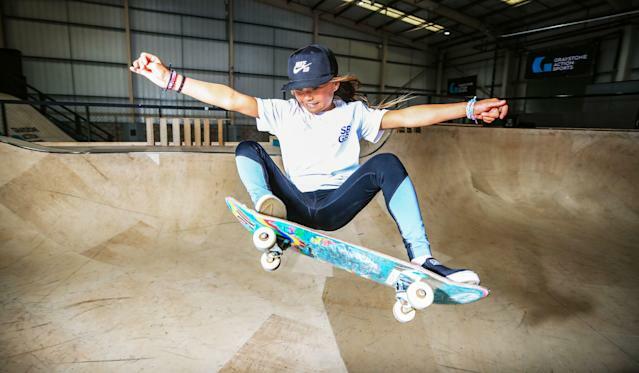 Ten-year-old skateboarder Sky Brown has won the senior women’s park title at the UK Skateboarding Championships, earning her first qualification points for the Tokyo Olympics. Brown, who hopes to become Britain’s youngest summer Olympian at the Tokyo 2020 Games, took home the gold medal at the National Skateboarding Championships in Salford. She scored 308 points over the two runs, 30-year-old Amy Ram took silver with 275 and Rebecca Davies won bronze with 260 points. Although she was born in Japan and spends much of her time in the US, Brown opted to represent Great Britain and has received funding from UK Sport to help her achieve her aim of becoming Britain’s youngest ever Olympian. The Aspiration Fund is designed to help athletes in sports which fall outside the scope of traditional funding. Skateboarding will make its debut in Tokyo alongside surfing, climbing and karate as the International Olympic Committee looks to put the Olympic spotlight on sports that are attractive to a younger audience. As well as skateboarding, the young prodigy has a talent for surfing, and her father confirmed she’ll be back in the UK in May to compete at the National Surfing Championships in Cornwall.